To update records in Salesforce in bulk, you will first need to pull them to your Excel spreadsheet. You can do it via either SOQL or Reports. Please note that we’re pulling record IDs. A column of record IDs is required to be able to update records in Salesforce.com. 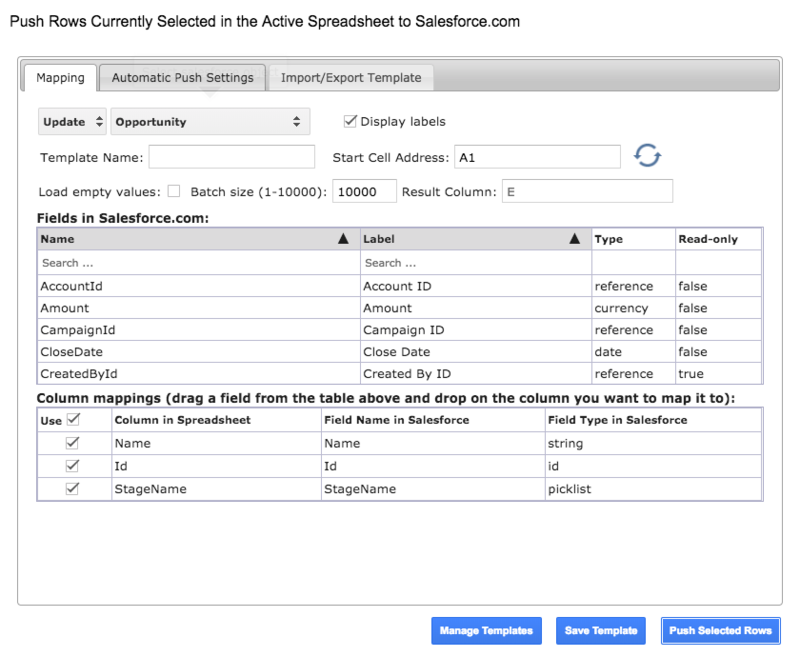 G-Connector will try to automatically map your spreadsheet columns to the corresponding fields in Salesforce, and because we pulled data using SOQL – in this case it will map all columns correctly. However, please verify the mappings each time before proceeding with an update and re-map if necessary. Incorrect mappings may lead to unrecoverable data loss! The top table in the mapping dialog lists all available fields from the selected object. You can map your spreadsheet columns to fields in Salesforce by dragging fields from the top table and dropping them on the column names in the bottom table. Click on Save Template to save the current mappings and other settings in this dialog box as a template for future re-use. After you’ve verified your mappings and re-mapped if necessary, you you need to do is click Push Selected Rows, and all the Opportunity records will get updated.